Golf Koh Samui offers a peaceful and relaxing golf tour to Thailand. From ancient Buddha images to modern, colorful temples, there is a vast selection of interesting places to visit and sights to see. The white sandy beaches are fringed with coconut palms; with the top hotels located close by. 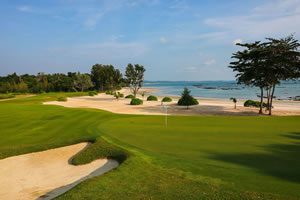 It is the perfect setting for a custom golf tour Thailand and can be visited as part of a broader trip through Thailand golf tours. 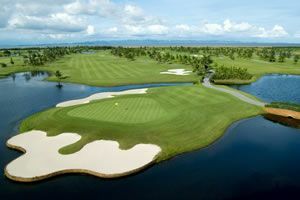 The Island is now host to a championship standard course in Santiburi Samui Country Club, which has stunning views of the ocean and is getting a name as one of the top Thailand golf courses. A custom golf tour Thailand, Koh Samui also offers a unique dining experience, its seafood dishes are unrivalled as well as a wide selection of international cuisines. The variety of seasonal tropical fruits are unsurpassed it is referred to as the island of coconut trees. Unique jewelry, souvenirs, textiles and handicrafts are produced by the local people and make night markets bustling vibrant centers. No golf tour Thailand is complete without a trip to this secluded paradise.